In this “Testing Sounds” series, you’ll hear about the “testing” part of the cochlear implant process, which occurs as soon as you’re ready to step out into the world after rehab. I spent one month testing sounds, and was able to end my mapping sessions in three weeks earlier than predicted. During this month, I tested EVERYTHING I could think of. Happy to share the experiences with you. I did 3 weeks of rehab sessions before my CI team realized that I was wasting both my time and theirs. I could understand everything when I was in a quiet place talking to one or two people. I could understand most of what was being said on recorded audio, the radio, and on the phone. To them I was a bit of a hell-raiser. My problem was getting the world to sound like I wanted it to sound. I was so used to hearing well and knew exactly what and how things should sound. Hence, it was time to introduce the CI to the real world. As I mentioned in a previous post, the CI may sound fine in the audiologist’s office, but it’s a noisy world and every environment is very different. So it makes sense that I had to test sounds in the types of places and situations I would usually find myself in. Of course, after testing each environment, I would ask my audiologist for adjustments. It took four rounds of testing and mappings to get close to “normal,” or at a level that I was comfortable with. I used program 3 almost everywhere. But in loud / big places, it made people sound more muffled. So I had to switch to 2. But while it made voices clearer, it also cut volume whenever there was loud noise or music. The audiologist brought down some frequencies to see if it would make sounds clearer. This made 3 sound even more muffled…but 2 even clearer. Since I had to keep switching whenever volume got cut, this was the most uncomfortable week in the testing period. Program 2 was clear and I would use it whenever I wanted to bring out voices and dim the background noise a bit, for example if I’m in a car and I want to hear the people clearer than the car noises, I can use that. So the audiologist left this as is. Then, she added some high frequencies to program 3. This made it much better, and I was able to resume to using that one. One problem: it was too loud. I used it at volume 1 or 2 instead of the normal 6. I explained to my audiologist that I was comfortable with program 3 and that I didn’t really need to switch (cause that seemed to be her goal.) I only used Scan if I wanted to have a conversation in a noisy place, like a loud restaurant. “How many times do you go in noisy places?” she asked. Several times a week actually. I think I was now officially her most hell-raising client. Only, I prefered the way program 3 sounded the week before. It was clearer, but a bit too loud. The next day, I had another hearing test. This time, I noticed that it took less effort to recognize the short words, because consonant sounds got clearer with each mapping. So in this Testing Sounds series, I’m going to describe what it was like to test sounds in the many different environments I tested them in. Let’s start with my office. 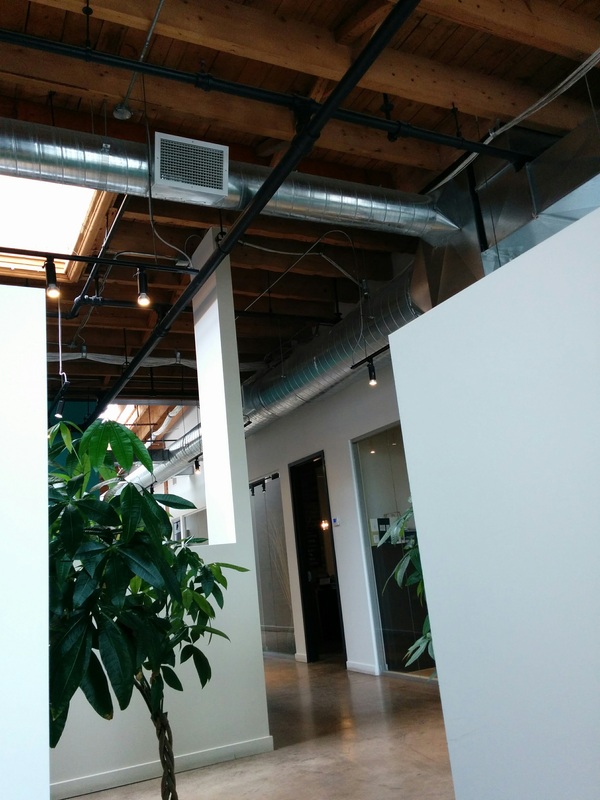 I work in a loft-style office with high ceilings, wooden pillars, brick walls, large windows, and ventilation systems. See the picture at the right. And the cover photo. Add construction season, which lasts months, or sometimes all year. All these factors already make for bad acoustics, so I was anxious to test the sounds there as soon as I could. So I went to the office once or twice a week. At first the sounds were very echo-y, especially in the meeting rooms because they were more hollow. The walls and doors are made of glass, so when sounds hit it, it was as if they bounced off it. At the beginning, any programs with SLS did not work well in meetings or group conversations. Every time more one person spoke at the same time, the volume got cut. So I had a choice of getting voices cut, or hearing echo-y voices. The program with no treatment was picking up every little thing. The ventilation sounded closer than it was. I could hear people typing loudly. I could hear people talk on the phone from a couple of desks away, but I couldn’t understand what they were saying. But with every adjustment, sounds got less echo-y, and by week 3, we were able to map the untreated program so that the both the volume and clarity was more comfortable. I’ll follow up with a post about my official return to the office soon. Keep up with the rest of my testing process by liking my Facebook page.